In a matchup of two highly-ranked teams on Saturday, the No. 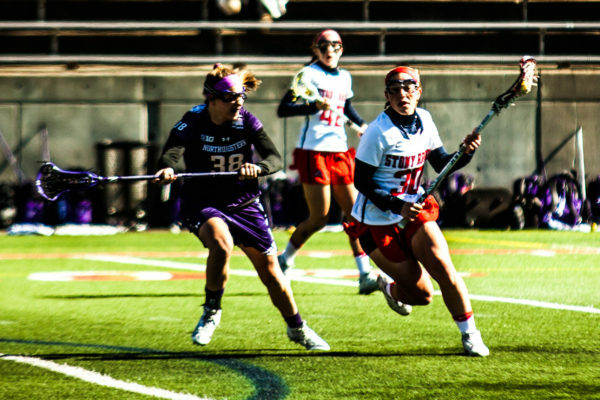 7 Stony Brook women’s lacrosse team saw its high-powered defense fold under immense pressure from the University of Florida’s offense. The Seawolves suffered their first loss of the season, falling to the No. 3 team in the country 22-14. The lopsided score, which included the Gators taking 10-goal leads multiple times, was a result of two critical areas of the game: free-position shot conversion and draw controls. The draw controls, 23-14, had an almost direct correlation to the final score of the game, with Florida’s 9-0 scoring run over the final 15 minutes of the first half coming from winning all the draws. In conjunction with their struggles on draws, the Seawolves had ample opportunities to chip away at the lead with free-position attempts from penalties in the eight-meter fan. Their conversion percentage on the free shot attempts was a poor 17 percent. If any of those misses went in, the complexion of the game could have changed. On the Seawolves’ side, junior attacker Kylie Ohlmiller again led the offense with seven points, including four goals. Her sister, freshman attacker Taryn Ohlmiller, scored three goals and added one assist. Senior attacker Courtney Murphy — the most prolific scorer in school history — missed her second straight game. Florida’s own high-powered offense was led by senior attacker Mollie Stevens, who led all scorers with seven goals including three during the 9-0 Gator run. Stevens had help from Florida’s own pair of offensively gifted sisters – sophomore Sydney and junior Shayna Pirreca tacked on six and five points, respectively. The game had a measuring-stick aspect to it, where Stony Brook had a chance against an acclaimed program to show where it fit into the national picture with several games against ranked opponents still to go. Stony Brook will return to action on Monday at 7 p.m. at Jacksonville University. The Seawolves defeated the Dolphins, 16-6, last season.